Nico Rosberg does not easily get upset and is usually the nice guy around the paddock, but he has revealed that he was not too happy with Sebastian Vettel's suggestion that his rivals are lazy . After a dominating performance which just blew away the competition Vettel tried to explain Red Bull’s huge advantage by stating that while his team works “very hard”, the others are “hanging their balls in the pool very early on Fridays”. 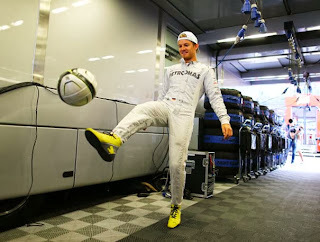 Nico Rosberg is quoted in Germany's Auto Motor und Sport as responding by saying that, “Maybe he shouldn’t be thinking about my balls." And as Formula 1 fans and journalists alike ponder over why Vettel is being booed on post-race podiums, Rosberg said comments like the one made in Singapore do him no favours. “He is in very clear danger of losing the respect of the other drivers,” he said. But Vettel said he found it “strange” that his comment caused such reactions.